Harry was rescued from the Santa Cruz Animal Shelter in late July 1998. 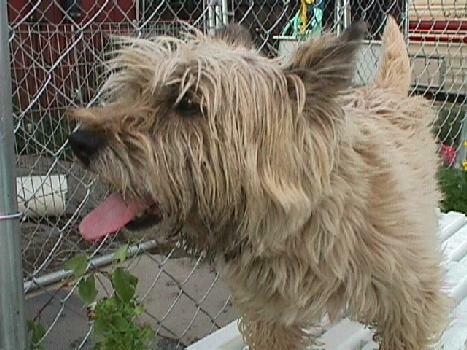 Harry was turned over to the shelter by his previous owners because he kept getting out of their yard. It seems that Harry is 8-years old and his "kids" grew up and moved away from home. 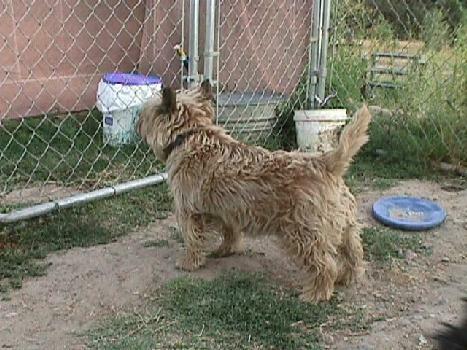 His "kids'" parents didn't want to be bothered with having a dog or fixing the yard fence. So now Harry is looking for a new home. Harry gets along great with other dogs and dosn't seem to be bothered by cats. He is well behaved and a happy, young 8-years old. Harry is in good health, his shots are current and he is neutered. 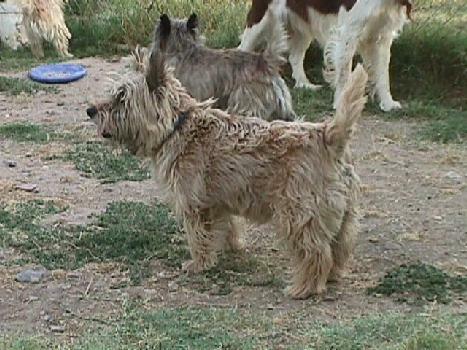 He is a big Cairn and needs to loose a pound or two. His coat has been clippered, but his coat and skin are in good shape. He doesn't mind being groomed and hand stripped. A Note from Harry's new owner. Sorry it's taken me a while to get the water dish back to you - we've been kept quite busy by our Harry. He's the greatest little dog in the world! We couldn't have asked for a sweeter, gentler, more well behaved dog - he's perfect! Thank you again for rescuing him and giving us the chance to befriend such a wonderful little guy. our Vet gave him a shot instead of the pills & his ear is all clear. I've been brushing him weekly & cleaning his teeth too! He and I go for a 1 to 1-1/2 hour walk daily and he loves it! He chews on Nylabones & plays with rubber balls and once in a while he'll even return it to you! He has 2 beds in the house that he can choose to sleep in and seems quite settled-in after the 2nd night. I gave him free reign of the house that Thursday night and he's never once soiled or tried to "mark" in the house! He doesn't chew or have any bad habits and he loves to go wherever we do - even if it means a one-hour car ride there and back. He never complains and he curls up on the couch with me in the evening to watch TV, which is nice 'cause we keep each other warm. As soon as we've finished a roll of film, I'll send you a few. 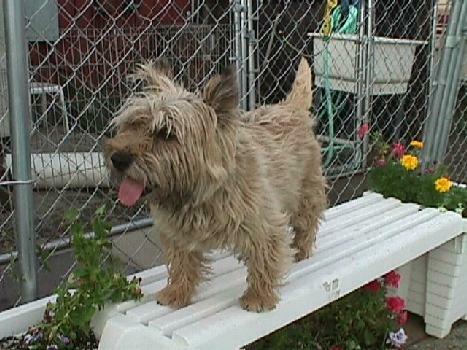 If you are interested in adopting a dog like Harry please contact me at jerrie@rose-croft.dk or call (209) 772-2724.